This tool creates Sankey overlays for bar charts. 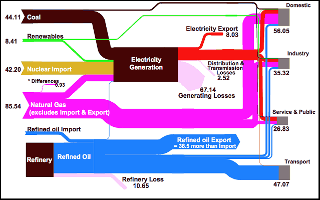 You can read more about Sankey diagrams and the rationale for using them below. 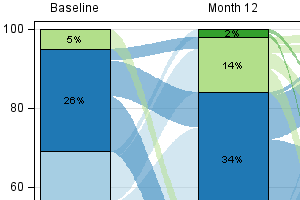 An interactive Sankey example is provided, but the real star of the show here is the SAS Macro developed by Shane Rosanbalm. 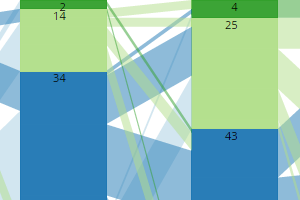 Sankey diagrams provide a visual depiction of the magnitude of flow between nodes in a network. 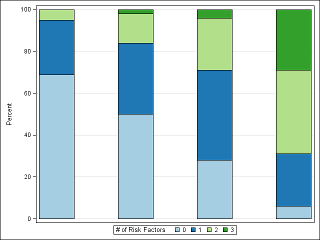 The longitundal bar chart at left depicts data that is collected on the number of risk factors that subjects exhibit at each of several study visits. You might collect data on risk factors when direct measurement of the disease of interest is invasive or cost-prohibitive. This series of web pages presents a tool designed to create longitudinal bar charts with Sankey-style overlays. 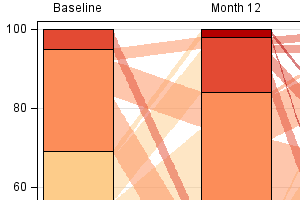 The Sankey-style overlays allow the reviewer to more easily answer questions like: Which group spawned the 2% of subjects with 3 risk factors at Month 12?